First cruise and I was terrified due to negative reviews on here. 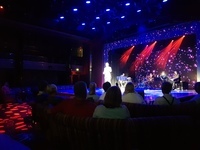 Our review...well we are now hooked....an amazing cruise. We ate everywhere...enjoyed it all. The ships crew are constantly cleaning to keep the ship presentable. The entertainment is amazing. Attend as much as possible. All incredibly enjoyable especial the Maquee live shows. Entertainment crew hilarious Mathew Dom Pablo Miguel etc. We had the smaller cheaper cabins which were perfect for our budget and needs....hot showers were amazing. Many reviews complained about the interior being old....well I&apos;m no spring chicken either any more but it&apos;s how you present yourself and this ship is no different....the decor is gorgeous. 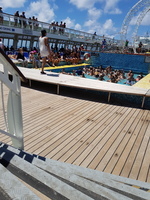 We did a few pacific Islands and pre booked our tours through the ship and had a great time being emersed in the culture and saw some amazing scenery. All our kids 3-17 attended kids clubs Turtle cove HQ and HQ+ and loved it experience. We also had EDGE packages. These were prepaid great for 7-25yrs. Our adults would probably pay per session next time as didn&apos;t get the value from pre purchasing. Thankyou from the bottom of our hearts for your passion to serve. Sad to see you retiring but hope to travel again with P&O and see some familiar faces. We had a number of cabins. All suitable to our needs. Tour was great but couldn't swim due to jellyfish. Obviously an uncontrollable natural event. Beautiful beach to do snorkeling. Hire a chair $10 and sit on the beach great for the elderly like my mum or snorkeling gear for $15. Amazing tour a must do. Town market and museum also a must.